Lately, I’ve been pulling my hair out trying to get our blog posts to be publicized on Facebook. I followed the directions step by step to no avail. Arghhh!!! So this is actually a test (of my patience) to see if it will work this time! She has a happy sunflower face! Always remember that home is where the heart is … and there’s no place like home! 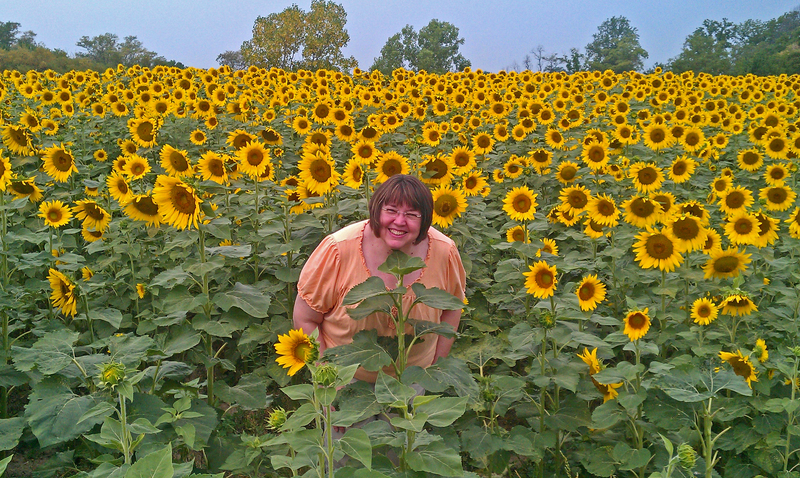 Categories: Family, Fun | Tags: facebook sunflowers publicize | Permalink. One of my favorite new (to me) blogs is Three Chic Geeks. Basically, they took all my fandoms and neatly wraps them up in one geeky/nerdy fabulous package. Love it! Anyway, today Critique Geek shared some ways to celebrate the birthdays of Harry Potter and his wonderful creator, J.K.Rowling. I especially love her tenth suggestion…check it out! Today marks the 33rd birthday of that messy-haired boy with the funny looking scar with whom many of us grew up. It also happens to be the birthday of Queen Rowling, the brilliant mind that brought us the HP universe and everything we love about it. In order to commemorate this special day, we’ve compiled a list of ways to celebrate Harry James Potter, Hogwarts, and the magic of friendship. Plus there ain’t no party like a Hogwarts party cuz a Hogwarts party don’t stop! Categories: Books, Family, Fun | Permalink. It’s that time of year again, folks. No, not tax time…though, as a friendly reminder from me to you, next Monday is April 15th – time to get your taxes filed! Today is the St. Louis Cardinals home opener! Since no one has declared Opening Day a “St. Louisans-Don’t-Have-To-Work Day”, I listened to the festivities on 1120AM KMOX. I know I’m only in my mid-thirties, but listening to games on KMOX really brings me back to being a kid…growing up in central Illinois meant you either watched games on TV or listened to KMOX. I’ve listened to countless games, and never have I been so moved than today. Stan “The Man” Musial passed away in January of this year. He is synonymous with the Cardinals, and with being a St. Louisan. I work in St. Louis, and drive by Busch Stadium each day. I remember seeing the Stan statue completely surrounded by gifts and tributes to “The Man”, and how touched I was that his family was willing to open up their grieving process to the millions of Cardinal fans around the world. The Opening Day ceremony started with the entrance of the Clydesdales, then a tribute to Stan. The starting lineup was introduced, then another moment of silence in honor of all those we have lost, including the tragedy at Sandy Hook Elementary last December. I started tearing up with the initial tribute to Stan…and pert near lost it at the end, especially when the National Anthem was played by the Gateway Harmonica Club…Stan was a lifelong member of the club. The Cardinals have always been a classy organization, and it really showed today. They are planning a bigger tribute to Stan at Friday night’s game, and man…I wish I could be there! Does anyone have a pair of tickets they’d like to give me? Anybody? I actually looked forward to my drive home tonight, knowing that I would be able to look into the stadium as I passed it. Granted, it was a tiny view, and I had to focus on the task at hand – safe driving. But I could smell the food…I could just barely see the fans decked out in red. Attending a home opener is definitely on my bucket list! Even though the Cardinals lost (okay, “got their butts handed to them in the 9th inning” is more appropriate), it’s still been a great Opening Day for me. Today is the first of many afternoons where I’ll get a peek inside Busch…a peek inside America’s pastime. And right now, I’m watching The Sandlot, probably my second favorite baseball movie ever (A League of Their Own is my absolute favorite movie of all time), remembering when Dad used to take me and Greg to see the Cardinals play in old Busch and how we’d take our gloves, even though there was no way any ball was getting hit that far up…when we used to go to games in Springfield, IL, first Cardinals, then Sultans (the club in town now is the Springfield Sliders, and is part of the Prospect League). Categories: Family, Fun, St. Louis Cardinals | Tags: bucket list, good times, memories, sports | Permalink. Sometimes we complain, but there is something beautiful about getting up before everyone else to get better at what we love. – Olympic Gold Medalist Missy Franklin on getting up at 4:45 a.m. for swimming practice. This evening on ABC News I was watching the piece on Olympic Gold Medalist Missy Franklin competing in her high school swim meet. She was so full of joy doing what she loves to do – be in the water and swim faster than everyone else! The journalist asked the coach of the opposing team if she thought it was fair that an Olympic gold medalist was competing in a high school meet. Without hesitation she said it was wonderful and that the girls on her team had been looking forward to swimming with Missy. She said it was the closest they would ever be to Olympic glory and they were excited about it! I just thought that was so cool. Mind you, Missy lapped all but one of the swimmers in the pool with her and won one of her races by 20 seconds! No jealousy or feelings of anything about it being unfair though. Very classy girls! If you missed it on TV, the video from ABC News may be viewed here. I hope you’ll enjoy it as much as I did. Categories: Fun | Tags: fun, sports | Permalink. Today is Veterans’ Day, a fantastic opportunity to thank the veterans in our lives, and to remember those who are no longer with us. I would like to take this time to thank the servicemen in my family: my Papa, Uncle Jim, Uncle Jerry, Darren, Eric, Brian, Jordan, Christopher, and Jonathan. (If I have left anyone out, it was not intentional.) With this in mind, I wanted to share one of the things Steven and I did this year. On September 16, we attended the Scott Air Force Base (SAFB) air show. SAFB is located near Shiloh, Illinois, and holds the air show pretty much every year. Including my college years, I’ve lived in this area for 16 years, and this was the first year I attended the show. What on earth was I waiting for?! It was amazing! We had decided to attend the air show several days before we went. The first thing I like to do when planning an outing is some research. Having lived in this area for more than a decade, I already knew and understood the value to the surrounding community, but I wanted to get some more information on the show and the base itself. The base was originally named Scott Field when it was opened in 1917, as one of the first aviation stations built to support the US effort in World War I. From the start, Scott has enjoyed the support of the local community, who “hosted dances and receptions, established a library branch on the field, and invited soldiers into their homes for Thanksgiving dinners” (source: Scott Factsheets). Scott Field, in turn, hosted its first air show, called Field Meet and Flight Exhibition, on August 17, 1918 and invited the public. If you haven’t done the math yet, SAFB is celebrating its 95th anniversary this year! Currently, Scott has roughly 7,900 active duty, National Guard, and Reserve personnel assigned. It also employees over 5,000 Federal civilian employees. The base also creates local jobs indirectly – more than 6,500 jobs! I didn’t grow up in a military family, so I have always been intrigued by living so close to a military base, and what that means to the community. The Air Show itself was very interesting. Once we walked from parking to the show (it felt like a million miles, but I think it was just 2 or so), they had different planes parked on the airstrip, and you could tour some of them! We walked through only one, a cargo plane, and the most surprising thing I saw was a pine tree-shaped air freshener! I don’t know why, but it just cracked me up. You could also get up close to lots of different planes, such as fighter jets and antique planes. They even had Air Force One! No tours through it, though… Oh well! The pinnacles of the show were the in-air demonstrations. The announcer described everything, from the type of plane to the pilot to the maneuvers. We saw a parachute squad, a B2 stealth bomber, and more. The headlining group, though, were The Thunderbirds. One word – Amazing. Now, I’ve watched Top Gun dozens of times, and am always amazed at the maneuvers the pilots pull off in the film. But to see, hear and feel it in person…wow. There’s nothing like it. In fact, my emotions caught up with me. The announcer would talk about how the pilots might use a particular maneuver in combat, and the truth of it all hit me. On that day, I was able to see the pilots complete maneuvers that they had been trained to use in defense of our country. In defense of me and you. All of a sudden, the tears came at the thought of their sacrifices…and not just the potential for the ultimate sacrifice, but sacrificing time with their loved ones while I was spending time with mine. Attending the air show was an amazing adventure, one that I will surely repeat in the future. If you live anywhere near SAFB (and we saw a bus from Kentucky), you should attend the air show at least once. I hope you enjoy it as much as I did. Note: For some reason, I can’t figure out how to upload my pictures from Flikr…so here’s a link to the set: SAFB Air Show 2012. Categories: Family, Fun, Local Attractions | Permalink. The Olympics Closing Ceremonies were Sunday night, and while I’m sad to see them end for this year, I am looking forward to Rio! This year’s Games were fantastic and memorable, not to mention groundbreaking. I watched Oscar Pistorius, the first double-amputee to compete in the Olympics, run in the semifinal for the 400m. While he didn’t qualify for the final, I was in awe when Kirani James of Grenada, who did win the heat, asked to switch name bibs with Pistorius after the race was over (James would go on to win the gold medal in the 400m). My heart went out to the German diver who did a “reverse bellyflop”, resulting in straight zeros for his score. I also watched Gabby Douglas experience the thrill of victory and the agony of defeat. Kirani James was one of 7 athletes who won the first medals for their country…ever! Michael Phelps won his last medals, totalling 22 for his Olympic career, more than any other athlete in history. I shed tears with Misty May-Treanor and Keri Walsh-Jennings when they won their third consecutive gold medal in beach volleyball. 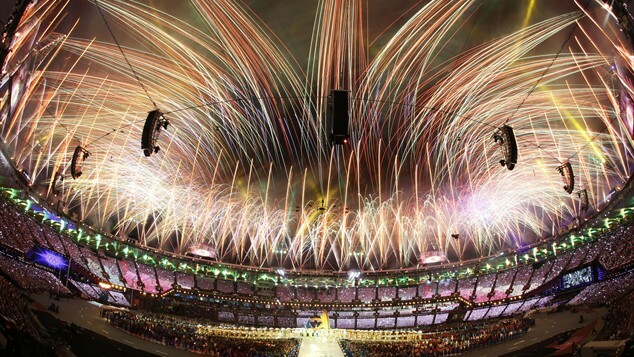 This was an awesome year for the athletes…and the Opening/Closing ceremonies were pretty awesome, too! I loved how the ceremonies were a lesson in the history of British literature and pop/rock music. “So tell me what you want/what you really really want”…the Spice Girls reunited was what I wanted…and the Ceremonies delivered! I am excited for the Rio de Janiero games in four years, and can’t wait to see what progression the games make in the meantime! Categories: Fun, Music | Tags: Olympics | Permalink.